Posted on November 22, 2016 at 4:35 pm. Regional Queensland could get a tourism boost if a long-touted casino consortium gets the go ahead to develop a new resort in the region. Plans for Aquis Casino in Cairns were unfortunately pulled back in August. Fairfax reports that confidential discussions are being organised by the state government, with a spokeswoman for State Development Minister Anthony Lynham saying all relevant parties including local governments, property developers and casino operators would be contacted to discuss a potential new casino site. 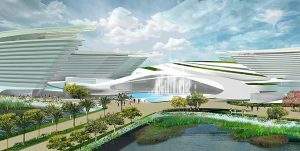 The proposal would need to factor in local and regional interests in a casino resort being built, with the likes of Cairns, Townsville, Rockhampton, Mackay, the Gold Coast and Sunshine Coast all likely to be considered. Any regional Queensland casino would be well off, however, with all necessary research being presented some time in 2017, with the next step being that to seek formal expressions of interest. The push by the government to discuss a new casino in the state comes after Aquis pulled its request for a casino license for its Yorkeys Knob development in Cairns. Hong Kong tycoon Tony Fung’s plans for a multi-billion dollar Cairns casino were dumped back in August. The Aquis Great Barrier Reef boss had for six years pushed to build an $8 billion casino resort on the Yorkey’s Knob site in Cairns, but now instead plans to develop a $2 billion luxury hotel, apartment and villa complex at the site, according to The Courier Mail. Mr Fung says a “nosedive” in the casino business had contributed to the decision to scrap the plans and instead focus on an accomodation complex. However, the Queensland government seems intent on moving ahead with plans for a casino. Dr Lynham has been vocal in saying that any projects must meet strict criteria to ensure they help boost international tourism in the region. If the government’s intention is to attract international tourism, generate jobs and turn far-north regional Queensland into a true tourism hub, then a casino resort would be one of the best ways to do that, especially considering the region’s proximity to Asia. Tropical Queensland is already a hot tourism spot for Asian visitors, and the addition of a casino resort to service growing interest in the region would not only service to expand the area’s tourist offerings, but also contribute to what could be a booming economy. There are already several casinos and gambling venues operating in Queensland, with a new license adding to the list. If you’re nowhere near one of Queensland’s casinos, there are plenty of online casinos available to players from United States. We highly recommend Bovada Casino as the safest and best online casino providing support for players from United States.